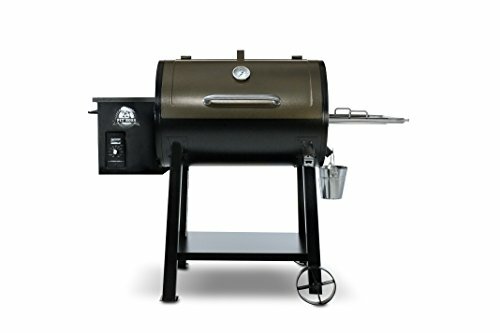 Top 5 Best Offset Pellet Smokers You Can Buy Online . The smoking concept is the same (i.e. with a “smoke box” on the side), but vertical smokers stack the meats on racks, one on top of the other like in a cabinet. We have lists of electric smokers and propane smokers worth checking out too. Still, my personal favorites are the wood smokers. Pellets can be a very convenient way to get the true wood-smoked taste without watching your fire 24/7. 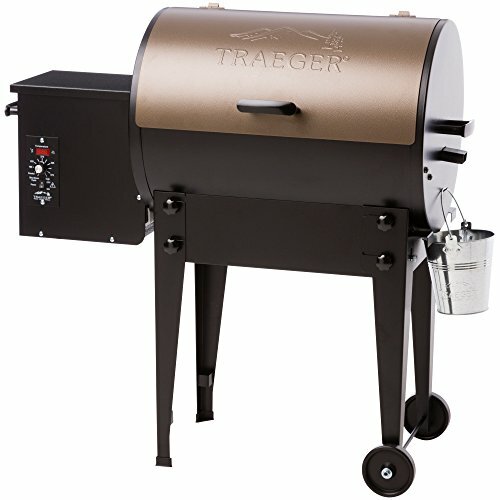 The Traeger brand has an excellent reputation in the pellet realm–after all, they were the first brand to make a pellet smoker. This bronze unit will stand out at any outdoor function. 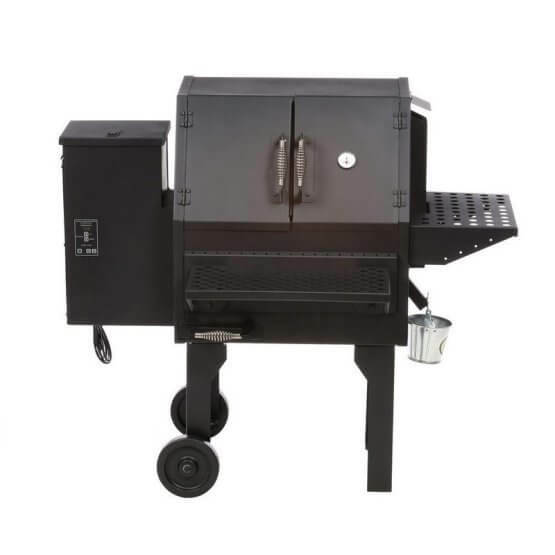 With 572 square inches of grilling space, they give you plenty of room to smoke your meat. If the need arises, you shouldn't have a problem moving the smoker around on unstable terrain. It has four wheels on the bottom–two larger ones on one end and two smaller ones on the other. One nice feature of the Traeger Pro Series 22 is the automatic auger. This unit automatically feeds wood pellets into the grill, which helps take a bit of the work out of smoking your food. The smoker also has a water pan on the side to help keep your cuts of meat juicy and tender. Features like these let you spend less time focusing on the smoker and more time relaxing with your friends. This might not be the most well-known offset pellet smoker, but it has become increasingly popular over time. The SmokePro SE has a built-in sensor gauge which entirely controls the internal cooking temperature. It also has a large pellet capacity, which saves you from refilling the hopper constantly. The two large wheels below the grill will help you take it wherever it needs to go. The handle near the pellet auger allowa you to tilt the grill up, making it easier to pull. This smoker can also help you eat healthier: Its grease drip disposal system allows grease to drain from your food. Made with tough, 14-gauge American steel, the Smoke N Sear pellet smoker is built to last. The matte black finish won't peel or deteriorate any time soon either. Unlike other smokers on this list, you can use this unit as a straight-ahead grill too. The Smoke N Sear has a push-button control that changes the temperature in 5-degree increments. This will help you keep the heat consistent, decreasing your odds of cooking your food unevenly. 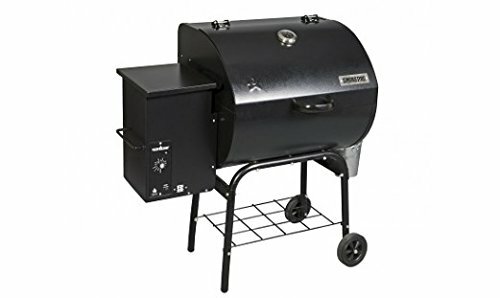 The smoker is easy to start up and has a large pellet capacity. 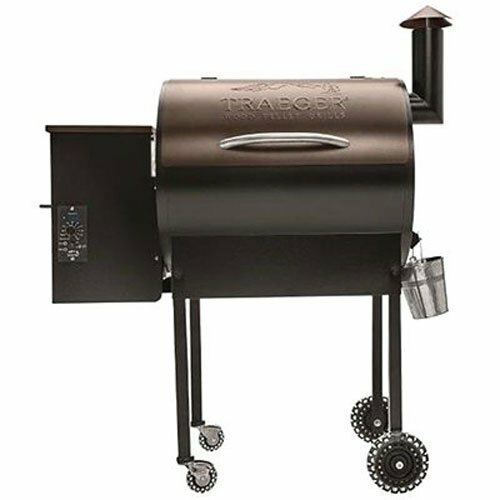 Traeger Tailgater 20 pellet smoker can cook food 6 different ways: You can smoke, bake, roast, braise, barbecue or grill it. Its integrated digital elite controller lets you keep the temperature consistent within 20 degrees Fahrenheit. You'll just need to turn the dial to get things started. The Tailgater 20 gives you 300 square inches of cooking space. That's enough space to cook up to 12 burgers, three racks of ribs and two whole chickens. The Tailgater has the tools you'll need to smoke food in any environment. Its EZ-fold legs allow you to pack it up and take it wherever you want to go. It can fit in the car for the big game or on your outdoor patio. The two wheels on the bottom make it even easier to move. The Pit Boss Grills 440 smoker gives you plenty of storage space. It has a side shelf that you can use for preparing food or just parking your drinks and snacks. It also has a bottom shelf that can hold a bag of wood pellets and other grilling accessories. The 440 has an automatic start and cool down system, which will help you save a lot of time on setup. Made with heavy-duty, 16-gauge steel, this smoker can take a beating and contain a lot of heat. It has a digital control dial with an LED readout that clearly shows you the temperature, making it easier to tell how long your food needs to cook. You should consider a few things before purchasing an offset pellet smoker. First, price. In the offset pellet smoker niche, high price doesn't always equal high quality. At the same time, buying a cheap, poorly made smoker can end up costing you more in repairs (if you don't end up replacing the hunk of junk altogether). Ultimately, it's best to check out the quality of the smoker's material first and then worry about the price tag. What kind of steel is a smoker made of? Is it thin and cheap or more heavy gauge? This makes a tremendous difference in cooking and smoking quality. Stainless steel is a popular option for buyers, but each brand has their own preferences in terms of material. Finally, think about how many people you usually cook for. 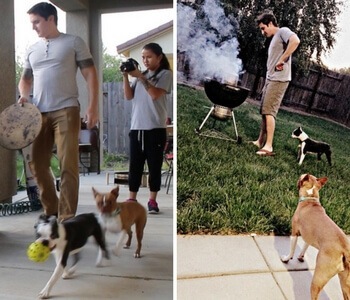 Just you and your dog? A large family? The more mouths you have to feed, the larger cooking surface you'll need. You could still get by with having a smaller smoker like the Traeger Pro Series 22, though–you'll just need to do multiple rounds of cooking. Offset pellet smokers give your food a strong, wood-smoked taste. These units are best known for cooking brisket, fish, ribs, turkey and other smoked foods. The best thing about them might be their temperature controls. While other types of grills typically need lots of attention to keep them hot, offset pellet smokers can handle that on their own. Every now and then, you might hear the term “pellet grill.” Most grilling enthusiasts tend not to use that term, since these smokers actually cooking food with indirect heat. They might take a bit longer, but the taste you get is worth it. The catalyst to the pellet smoking process is the digital controller. Modern controllers often have an LED display gives you an accurate temperature reading. Depending on which brand of smoker you have, you can set a specific temperature and let it cook for a long period of time. Offset pellet smokers have a box called the “auger.” This is where you put the pellets for burning. The auger has a deflector plate on top that absorbs heat and lets smoke spread throughout the cooking surface. Offset pellet smokers are notoriously tricky to clean. It's easy to get buildup on the heat deflector, which is usually right under the cooking grates. You’ll want to get gloves and something to wear over your clothes before you start cleaning. To properly clean an offset pellet smoker, you’ll need to remove the deflector plate and scrape away any residue. next, wash it off to get it ready for your next cooking session. This whole process can take 30-60 minutes. After you’ve used an offset pellet smoker a few times, it’s important to take out the burn cup and remove the ash. This will clear up space for burning more wood pellets. Another feature of offset pellet smokers that might dissuade some grillers is its dependence on electricity. The LED displays on their temperature gauges need power in order to function. This can be inconvenient for people who want to cook outdoors but may not have an outlet nearby necessarily. Still, offset pellet smokers can deliver great results if you're willing to work around these two drawbacks. Again, it's hard to beat the smoky taste that they give your food.